The last event in my excursion to Cheltenham Festival of Literature event was Poetry and all that Jazz, Slak Bar, night time. Is this Cotswolds town the festival capital of the world? It surely must be now. Cheltenham UK, the festival town. They can have that for free. Just did one day of Cheltenham Poetry Festival yesterday (it runs until Sunday) and had a great time. I was part of, ahem, select audiences who I got to know (hi to Ki and poets Nick and Alice). Cheltenham Poetry Festival opens today. 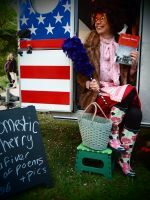 Current stinky cold willing, I’m off to see my crazy friends, Domestic Cherry and more tomorrow: poetry to the people!